Paudel, I., Halpern, M., Wagner, Y., Raveh, E., Yermiyahu, U., Hoch, G. and Klein, T. 2018. Elevated CO2 compensates for drought effects in lemon saplings via stomatal downregulation, increased soil moisture, and increased wood carbon storage. Environmental and Experimental Botany 148: 117-127. Drought is a naturally-occurring feature of climate that can wreak havoc on agricultural production, costing hundreds of millions of dollars in economic losses in some cases. In the future, however, such losses will likely be tempered thanks to rising atmospheric CO2. Consider, for example, the results of a recent study conducted by Paudel et al. (2018). 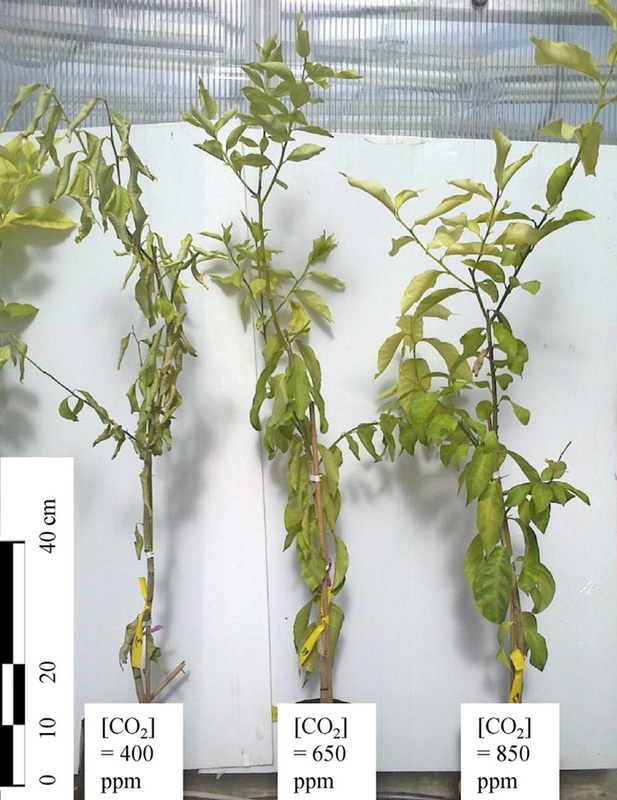 Working at the Gilat Research Station in southern Israel, the team of seven scientists examined the interactive effects of elevated atmospheric CO2 concentrations and drought on lemon trees (Citrus limon, var. Villafranca). More specifically, over a four-month period they exposed one-year-old saplings in a climate-controlled greenhouse environment to one of three CO2 regimes (400, 650 or 800 ppm) and two watering cycles: adequate water and drought, the latter of which was accomplished by initiating a one month dry-down (the third month of the experiment) with no irrigation, followed by a month-long period of re-watering at normal levels. During the length of the experiment, the researchers conducted multiple measurements pertaining to tree growth, water use and nutrition status. Their results indicated that under adequate water conditions the CO2-enriched trees had greater rates of photosynthesis than those in ambient air (400 ppm), averaging 18 and 33 percent higher in the 650 and 850 ppm treatments, respectively. Under drought, trees in all CO2 treatments exhibited a negative carbon balance, although the balance was only about half as negative under elevated CO2 compared to control. What is more, following the drought period and upon re-watering, the authors report that "photosynthesis recovered in all trees, but more so in trees grown under elevated CO2." Paudel et al. also report that leaf transpiration and diurnal plant water-use were "13-46% lower at elevated vs. ambient CO2 but photosynthesis was still 15-25% higher." With respect to biomass, under normal CO2 levels, trees in the drought treatment had approximately 39% less dry weight than those receiving adequate water. Under adequate water conditions, elevated CO2 boosted dry weights by approximately 13% above that experienced under ambient CO2 conditions; and dry weights of trees in the elevated CO2 and drought treatments were nearly equal to that experienced under adequate water and normal CO2 (the control). Finally, tree dry weights in the elevated CO2 and drought treatment were approximately 28% and 34% higher than that experienced in the normal CO2 and drought treatment. Other notable findings included a CO2-induced increase in tree stem diameter under adequate water treatment. Under drought conditions, stem diameter increment was observed to have significantly decreased in ambient CO2 trees relative to those grown under elevated CO2. Additionally, analysis of macro elements in dry leaf tissue showed similar values across all CO2 and irrigation treatments, falling within observed ranges for healthy leaves. In commenting on their findings, Paudel et al. say their results indicate that "in a high-CO2 future, fruit trees in orchards, and perhaps forest trees ... will (1) use less water, at otherwise similar conditions, than today; (2) have higher water availability when drought hits; and (3) have higher carbon storage to survive through drought." And these findings are very promising news in regard to society's efforts to combat (and overcome) the effects of drought on lemon (and other) trees in the years and decades ahead. Rising atmospheric CO2 will help to increase tree growth and alleviate the effects of drought. Figure 1. Lemon saplings after 4 weeks exposure to the same drought regime. Source: Paudel et al. (2018).